Employer-sponsored healthcare spending rose to its highest point in 2016 even though patients sought less healthcare. The culprit? Rising healthcare prices, according to the latest annual report by the Health Care Cost Institute. "Working Americans are using the same or less healthcare and are paying more and more for it every year," HCCI President Niall Brennan said. Spending per person in 2016 grew 4.6% to $5,407 over 2015. In 2015, spending grew 4.1% over the prior year. Healthcare spending per person has grown cumulatively by 15% over the entire study period of 2012 to 2016, according to the report released Tuesday. In 2016, increased spending was driven mostly by the cost of outpatient services, such as emergency room visits and surgeries, as well as prescription drug prices. Per person spending on outpatient services reached $1,507 in 2016, an increase of 6.2% over 2015, while spending on prescription drugs totaled $1,030, up 5.1%. Spending on drugs did moderate a bit from the 10.4% growth seen in 2015. Spending on inpatient services grew more slowly, up 4.1% to $1,049 in 2016. Spending on professional services, which includes visits to physicians, administered drugs, anesthesia, radiology and pathology, rose 3.5% to $1,821. Spending has gone up even though the use of most healthcare services held steady or declined both in 2016 and overall from 2012-16. Brennan said the decrease in the use of healthcare services among workers in employer-sponsored plans, which cover some 155 million people, could stem from the lingering effects of the economic recession or the migration of workers toward high-deductible health plans. Employers have held down costs by shifting patients to high-deductible plans aimed at giving workers more "skin in the game." They've also used incentives to drive employees toward high-quality, low-cost providers in narrow networks. About 28% of all covered workers are enrolled in a high-deductible health plan, down slightly from 29% in 2016 but up from just a quarter of workers in 2015, a recent Kaiser Family Foundation report found. But as deductibles increase, Americans have a harder time paying for healthcare and start to put off both unnecessary and necessary care. 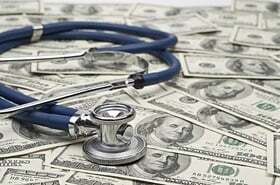 Meanwhile, the prices of healthcare services have risen enough to offset any deceases in healthcare use. HCCI observed price increases across nearly all healthcare service categories studied over the five-year period. The average price of a surgical inpatient hospital admission, for example, rose a cumulative 30% to an average $41,702 per admission in 2016 over 2012. Though there was a 16% decrease in the use of surgical admissions over that period, the increase in price drove a 9% increase in spending overall. The study also found large price increases for administered drugs (up 42% to $581 on average) and outpatient ER visits (up 31% to $1,917 on average) over the five-year period. Prices did decline in some cases, but by small amounts. For example, the price of an average outpatient observation stay dipped by $25 between 2015 and 2016, according to the report. It's difficult to pin down just what's driving the increase in prices, which can vary by thousands of dollars between hospitals within the same neighborhood for the same service. But many experts argue that competition among providers, or the lack thereof, is a major driver of healthcare price increases in a market. HCCI based its findings on claims data for 39 million U.S. patients under age 65 who were enrolled in employer-sponsored health insurance from 2012-16. The claims data, representing about a quarter of all people covered by employer-based insurance, came from insurance companies including Aetna, Humana, Kaiser Permanente and UnitedHealthcare.